Collaborative media-sharing technology is a fairly new concept. These types of systems allow individuals to share the screen of their device, like a laptop or tablet, with a group in a quick and effective way. Originally collaborative technology was created around video conferencing, as many of the first generation devices were built for the purpose of video-conferencing and access to the internet. Recently schools and businesses of all sizes have started to request more collaborative technology. 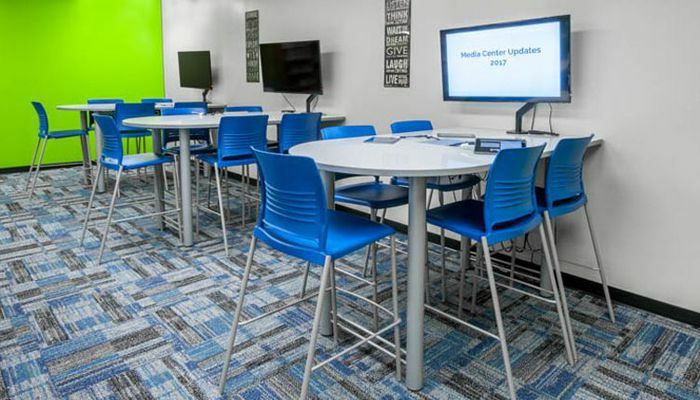 The DropShare media center is a solution by Interior Concepts that combines screen sharing technology and a conference table or collaborative desk. In a furniture solution enabled with DropShare, there’s a central hub where two, four, or six users can plug in via an HDMI or VGA cable to their laptop or their tablet. Devices plugged into the hub have their displays mirrored on the monitor connected to the DropShare system. Users at the table can choose which device is running the display with a simple click of the Share button on the port. The DropShare system includes a power center and screen scaring device. Unlike other screen sharing systems, this technology requires no driver downloads or network access, and it can work with any platform that can output to a VGA or HDMI cable, though some devices will need an adapter cable. Additionally, Interior Concepts can build your furniture around the DropShare Media System, so you are not locked into a standard furniture design. You will also find that compared to other media sharing technology, DropShare is affordable for organizations that are looking for a competitively priced media sharing solution. Most schools install DropShare on mobile tables, allowing teachers and lab coordinators to rearrange the displays to suit the lesson plan, or to move the entire DropShare unit around the district as needed. In business contexts, DropShare media sharing systems enable more productive meetings and smaller collaboration sessions. It’s astonishing how much less dead time there is at meetings when you aren’t having to shuffle laptops around for participants to look at drawings or planning charts, and the ability to switch which device feeds to the display at a push of a button allows each presenter to ‘have the big screen’ when it’s needed with a minimum of fuss. Many similar products are over-powered for the most common types of small scale and agile collaboration methods used by businesses and schools today. Also these systems often require downloads or Internet access along with help from IT. Those systems are fine for large corporations, but are often well beyond the budgets of most school districts and small businesses, which is why the DropShare is a good choice for most organizations. DropShare’s competitive pricing and simple approach to a common problem makes it the go-to solution for small-group collaboration and media sharing technology.